How would you feel if that happened? Would you be a little uncomfortable? I know I would. Well, that’s pretty much what the whole book of Amos is like. I like and dislike the words of the prophets. I like them because they have this unshakable trust in God no matter what God tells them to say, and they are direct, honest, and aren’t afraid to ruffle a few feathers. I dislike the prophets for basically the same reasons. They convict me and my silence. Before we go any further into this difficult message, I think it is important to stop and make sure we really understand what a prophet is. In our culture, when we hear the word prophet, we tend to think of a person who has a crystal ball and can see into the future. That’s not what a prophet is in the Bible. Instead, a prophet is more like this. Imagine that you have a friend or a family member who is caught in an addictive behavior. Maybe they’re addicted to drugs, or alcohol, or gambling, or they have an addictive spending habit, and are spiraling into credit card debt. You can see how this addictive behavior is destroying their life. Now, what would you say to that person if you were given the chance to tell them the whole truth, without any fear on your part? You would probably tell them three things. First, you would remind them that they are loved, and they are worthy of a better life than what they currently experience. Second, you would tell them about the consequences they will face, the destruction that will happen if they continue on the path they are on. Third, you will remind them that there is grace for past mistakes, and that if they would seek help, God would be there with them and there is a good chance they could find healing. That is exactly what a prophet was sent to do. A prophet was sent by God to deliver a message like that. God’s people were continually getting caught up in destructive patterns that would lead them into dangerous consequences. The prophets were sent to remind them who they were – God’s chosen people – and to warn them about the devastating consequences of their behavior, and offer them a message of hope if they would only seek God’s mercy and God’s help to change. And that brings us to Amos in our reading today. Amos was sent to the northern kingdom of Israel to preach just such a message. It was a time in the history of Israel when the leaders had lost their way. The powerful used their power to enrich themselves and advance their own agendas. The poor and the needy were forgotten. And religion, instead of challenging this, went along with the status quo. Things were going well for Israel. It was a time of national prosperity. There was a strong military. The economy was doing well. The stock market was up. But God saw something else in Israel. God saw their heart, their motivation. You see, they were worshipping, but they weren’t following God, they weren’t being just in their dealings with vulnerable people. And so God sends Amos, a farmer in the south, to speak a word of truth to the people in the Northern kingdom of Israel. Maybe God sent a farmer, because people would be more likely to listen to someone who knew their livelihood, rather than a professional preacher. We’re not told. But we are told what God says through Amos. Look at verses 21-23. They’re worshipping God the way he told them to worship – gathering for the Sabbath, keeping the festivals and holy days, bringing offerings, worshipping God with their voices and music. So, what is God’s problem? Doesn’t God want people to worship him? Isn’t that what the church is supposed to do? Look at verse 24. There’s a little word there – but. 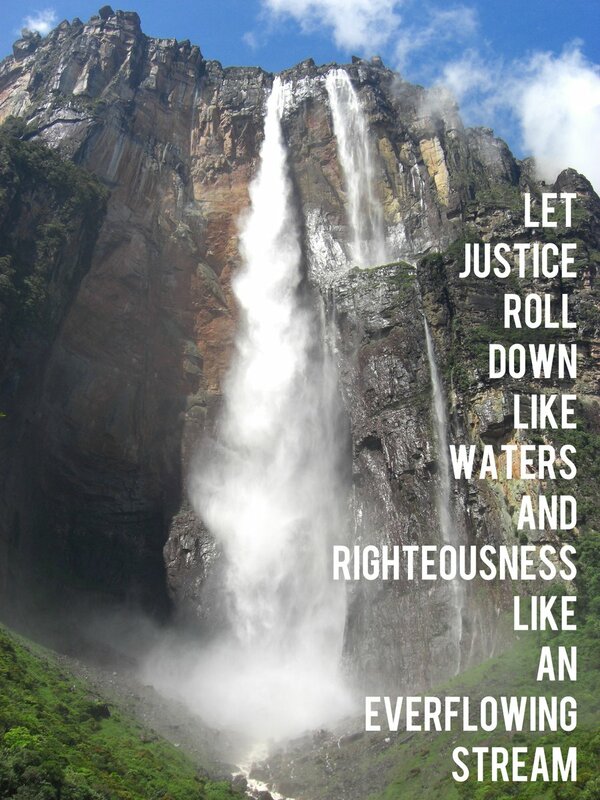 “But let justice roll down like waters, and righteousness like an ever-flowing stream.” What God really wants is justice and righteousness. The real question for us is this: What is justice? God’s idea of justice is the right treatment of people. That’s what the word “righteous means,” a right relationship with God and with people, especially the poor and the needy. And when our worship doesn’t lead to compassion for the vulnerable of this world, then God sees that our worship of him has lost its meaning and God hates it. Justice is what Jesus stands for, in our gospel lesson this morning. Jesus sees the crowd, and we are told, “He had compassion for them.” He cares about their lives and their struggles. The crowd is hungry and the disciples want to dismiss the crowd, but Jesus says, “You give them something to eat.” Jesus wants his disciples to participate in his compassion, his act of justice, for the needy. I hear God speaking to us this morning through our Bible readings – speaking to us in our daily lives. From our worship today, God sends us into our week, into our daily lives. Our worship is meant to stir our hearts to follow Jesus; our worship is meant to lead us to listen to the cries of the vulnerable and to seek justice for them; our worship is meant to lead us to a life of compassion for others. And this is what I hear God saying to us today – that in our worship, we would seek his strength, to go into our daily lives and to live as his disciples, ready to serve our neighbor in need. Let us go from this place to follow Jesus.